The London Foodie: L'Escargot and the Fentiman’s Cocktail Pop-up Bar - Les Amis du Chien! L'Escargot and the Fentiman’s Cocktail Pop-up Bar - Les Amis du Chien! Cost: Average cost is around £40 per person (not including drinks). The menu changes daily, but on the evening we were there, appetizers were from £7 to £14, fish dishes were £14 to £19, and meat main courses ranged from £14 to £28. Desserts cost £7 to £14. There is a good range of wines by the glass. Entry level wines included La Bastille 2013, an Ugni Blanc-Colombard blend for £21, and for the same price, La Bastille 2013 Carignan-Merlot blend. Laurent-Perrier Brut NV costs £58. About: L'Escargot has been a Soho institution for decades, serving traditional French fare in gorgeous dining rooms crammed with artwork. It has been under new ownership since 2013. I haven't been for ages, but the special opening of the normally members-only roof top bar (the Salon Noir) in August 2015 as the 'Living Botanical' cocktail bar featuring Fentimans adult soft drinks tempted me to make a return visit. Fentimans has teamed up with L'Escargot to launch a pop-up cocktail bar for the whole of August 2015. Fentimans drinks are brewed with botanicals for 7 days to make their mixers, and to reflect this the theme in the cocktail bar is a botanic garden and a range of summery long drinks. Until the 31st August 2015, so hurry for a visit this summer! Even better, the restaurant has a "les amis du chien" policy, possibly one of very few restaurants in London to welcome dogs, if you know others, please let me know! So I hurried along with Tofu and Truffle (duly washed and groomed for the occasion) to sample the cocktail bar and the restaurant's summer menu. The Fentimans Cocktail Pop-up bar is open until 1 am, Mondays to Saturdays, and offers a great opportunity to experience the members club without having to become a member of L'Escargot Club Privee. If you fancy joining anyway, the deal is that you arrange to meet the manager for a chat/coffee to discuss the membership - it is £365 to join for a year or £1 a day. The club includes a rooftop bar, and three additional dining rooms including a library, which can be also be booked as a private dining room. What We Ate: From a quite short menu put together by chef de cuisine Oliver Lesnik, we opted for the steak tartare (£12). Served with a quail egg yolk, this had had hand chopped beef and was nicely seasoned, although I would have liked it slightly more tart (perhaps more gherkin). The grilled native lobster with garlic butter (£18), had the delicious aroma of freshly grilled seafood, great texture and lovely garlic butter. For our main course, we had the Chateaubriand (£58 for 2), with side dishes of courgette fries (£6) and dauphinoise potatoes (£6). The Chateaubriand was excellent, although for 2 people I thought it was slightly optimistic to serve this as a portion. The Bernaise was delicious, with a powerful hit of tarragon. The red wine sauce was glossy, luxurious and richly flavoured. The courgette fries were very good, and I particularly enjoyed the saffron flavoured accompanying sauce. The potatoes were intensely unctuous and creamy. We finished the evening with a delectable crème brûlée (£8) – well made and as good as you can find at any top French restaurants. What We Drank: We kicked off with a couple of Fentimans cocktails in the rooftop bar. The “Little Treacle” features dark rum, lime, sugar, bitters, Fentimans dandelion and burdock. A very refreshing number, this had a good kick of alcohol while still having the traditional flavours of one of Dr G's favourite childhood drinks. The “Fearless Fun” had tequila, Cointreau and Fentimans ginger beer - a very good start to the evening, with the ginger really getting the digestive juices flowing. The “Easy Breezy” was a blend of VJJ Hills gin, grapefruit and Fentimans 19.05 herbal tonic, with a refreshing hit of grapefruit acidity. “Curiosity” had Bourbon, orange zest and Fentimans curiosity cola reduction, and was rich and spicy. 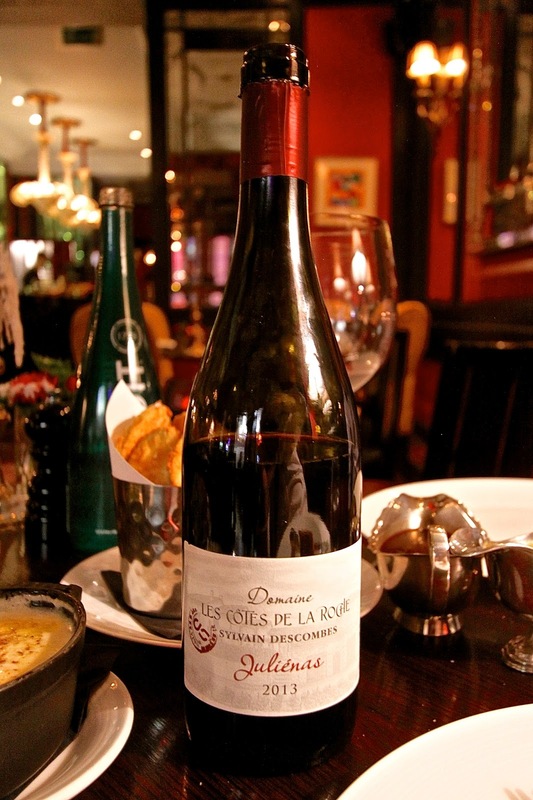 To accompany the Chateaubriand, we shared a bottle of Julienas, Gerard Descombes 2013 (£40). A good example of a Beaujolais Villages wines, this was light in colour and aroma, on the palate this had a good weight of raspberry and redcurrant fruit and balancing tannins, sufficient to stand up to the Chateaubriand on a balmy summer's evening. Likes: Its a huge treat to be able to take our dogs to dinner in a central London restaurant - this is totally normal in France, but in the UK I hope other restaurants will follow L’Escargot’s example. The August Fentimans cocktail bar is the place to head to this summer, and fantastic value for money. The Chateaubriand was perfect - flavoursome, excellent quality beef, beautifully cooked. The menu is not large, but everything we ate was delicious and very well made, in true brasserie style. Dislikes: where is the wonderful artwork? Verdict: For a French restaurant in the heart of Soho, L'Escargot has some great things to offer - the Fentimans great cocktail bar with top quality cocktails for a remarkably reasonable price, a central and fashionable location, and your dog (if you are lucky to have one) will be welcome! Tofu and Truffle highly recommend!